We all know that age old saying. It’s 150 years old, to be exact. 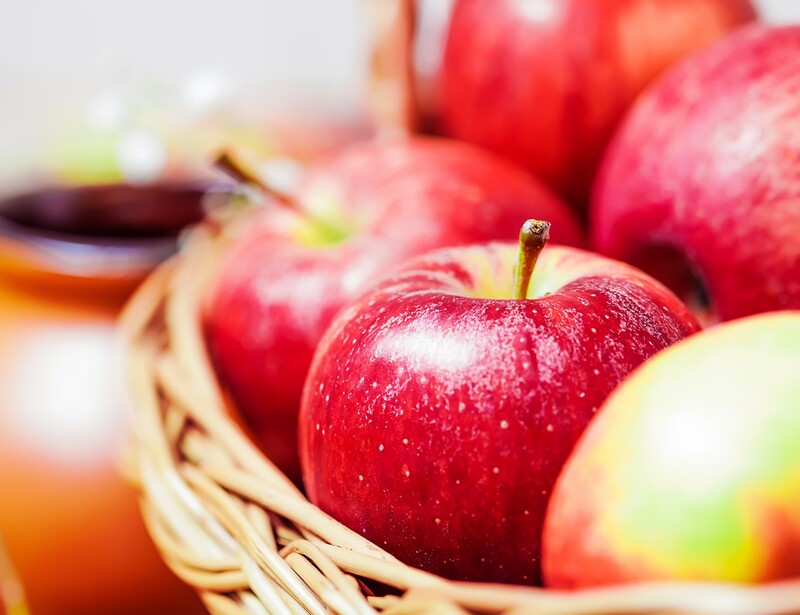 The apple is the world’s most eaten and popular fruit and is super healthy. Right on time for the imminent apple picking season, this time of year many countries celebrate Apple Day. Peeled, in a smoothie, or in some delicious apple pie… today, we will show you how to include the daily apple into your diet so you get the health benefits of the apple. The farther you cut into an apple, the fewer nutrients you’ll find. Many valuable vitamins are to be found directly under the skin. Plus, the apple’s skin provides you with digestion-aiding fiber and has positive effects on your cholerstol level. Conclusion: Your apple is healthier with skin (provided you’ve thoroughly washed it before). If you’re striving for a peaceful, enjoyable day, you better cut your apples (for you or the kids) into pieces. A Cornell study found that children were ruder and rowdier after having eaten their daily apple as a whole, biting chunks off with their teeth. What if you don’t have time to snack on a whole apple? Is it okay to substitute it with apple juice? Or maybe apple sauce? The American Journal of Clinical Nutrition published the following: Our body needs approx. 17 minutes to take in a whole apple, but only 6 minutes for apple sauce and 1.5 minutes for apple juice. Although blood sugar levels are quite similar in all three cases, apples eaten as a whole had one clear advantage: It kept the test persons fuller longer. The smaller the pieces of fiber taken in, the less we have to chew them, the shorter the feeling of satiety persisted. Many people believe that cider vinegar helps with weight loss. In Japan, a study on the subject was conducted with 175 overweight individuals who were administered either cider vinegar or water on a daily basis over a period of 12 weeks. Their diets were similar and every test person kept a nutrition diary. In the end, the cider vinegar group had lost 1 to 2 lbs (0.5 to 1 kg) more on average. As a result, scientists think that vinegar could play a role in fat reduction. So, if you like cider vinegar, why not drizzle a few spoonfuls over your salad. They are the perfect snack for your lunch box or on-the-go. Plus, you can easily make them at home and they contain a lot of important fiber. Since most nutrients are right under the skin, opt for unpeeled apple rings when buying them at the supermarket. The downside: In the drying process, the apples lose most of their Vitamin C content. Therefore, dried apple rings should be added to your daily apple portion rather than replace it. Preheat oven to 350° F / 180° C. Beat eggs, sugar, yogurt and oil until frothy. Peel the apples and cut into cubes. Mix cinnamon, baking powder and flour in an extra bowl, add apple cubes and stir until fully coated with the mixture. Mix all ingredients together, line your muffin tins and evenly distribute the batter into the muffin tins. Bake for approx. 20 minutes.